Lyra Research has released two new complementary reports that cover the ink jet printer market—Single-Function Ink Jet Printers: Worldwide Forecast, 2006–2013 and Ink Jet All-in-Ones: Worldwide Forecast, 2006–2013. The two new ink jet reports detail worldwide shipment, pricing, and revenue figures for the single-function ink jet printer and ink jet all-in-one (AIO) markets and are based on key findings from Lyra’s Hard Copy Industry Advisory Service (IAS) 2009 Forecast 360. Lyra Research, the digital imaging authority (http://www.lyra.com), has released two new complementary reports that cover the ink jet printer market—Single-Function Ink Jet Printers: Worldwide Forecast, 2006–2013 and Ink Jet All-in-Ones: Worldwide Forecast, 2006–2013. The two new ink jet reports detail worldwide shipment, pricing, and revenue figures for the single-function ink jet printer and ink jet all-in-one (AIO) markets and are based on key findings from Lyra’s Hard Copy Industry Advisory Service (IAS) 2009 Forecast 360. “These two new ink jet market reports clearly detail the value proposition of additional functionality in the rise of the ink jet all-in-one market compared with the single-function ink jet printer market. This data and analysis will enable ink jet printer vendors to determine where opportunities exist and will highlight the pricing and product trends that they should keep in mind as the product shift continues and the economy begins to rebound,” comments Larry Jamieson, director of Lyra’s Hard Copy Industry Advisory Service. Single-Function Ink Jet Printers: Worldwide Forecast, 2006–2013 examines the decline of the single-function ink jet printer market and how the economic recession, the migration to ink jet all-in-one devices, and the growth of home WiFi networks have increased the pace of this downward spiral. The report also explains that cost-conscious first-time buyers in emerging markets will continue to be interested in purchasing single-function ink jet printers. Specifically, this report covers general-purpose A4 and A3 ink jet printers and photo-specialty A4, A3, and Snapshot ink jet printers. It offers information regarding shipments, installed base, revenue, and pricing. Regional shipment breakdowns are also provided for North America; Latin America; Europe, the Middle East, and Africa (EMEA); and Asia Pacific. For more information on Single-Function Ink Jet Printers: Worldwide Forecast, 2006–2013, please visit http://lyra.ecnext.com/coms2/summary_0290-1042_ITM. Ink Jet All-in-Ones: Worldwide Forecast, 2006–2013 discusses how ink jet AIOs essentially have replaced single-function ink jet printers as the standard home and small office/home office (SOHO) printing device. The report explains that this market—unlike many other imaging industry segments—is expected to expand through 2013. In 2008, total shipments for ink jet AIOs reached nearly 65.7 million units (see figure). By 2013, shipments will be approximately 74 million units. This report also breaks down the ink jet AIO market by segment—photo-specialty, general-purpose business, and general-purpose consumer—and discusses shipments by regions—North America, Latin America, EMEA, and Asia Pacific. It also examines how ink jet AIOs are gaining acceptance in emerging markets as prices for these machines drop to levels similar to those of single-function printers and as more users become comfortable with the additional features that AIOs offer. 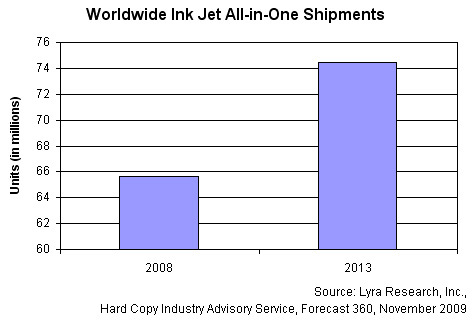 For more information on Ink Jet All-in-Ones: Worldwide Forecast, 2006–2013 report, please visit http://lyra.ecnext.com/coms2/summary_0290-1044_ITM. The two ink jet reports—Single-Function Ink Jet Printers: Worldwide Forecast, 2006–2013 and Ink Jet All-in-Ones: Worldwide Forecast, 2006–2013—can be immediately purchased for $950 per report. For more information about report purchasing options, please contact Sandy Tobin, client relations manager, at 617-454-2612 or stobin (at) lyra (dot) com, or visit Lyra’s online store at http://lyra.ecnext.com/coms2/page_browse. Sign up now for Lyra’s Hard Copy, Marking Supplies, Media Supplies, Wide-Format, Consumer Imaging, Europe, and China Research Briefs, which feature forecast information and primary research data. The research briefs are delivered via e-mail approximately every quarter. Special bulletins also are distributed that contain information regarding Webcasts and events related to each of the topics in the briefs. To update your profile and add your name to the mailing list, click here http://visitor.constantcontact.com/d.jsp?m=1101693414919&p=oi and enter your e-mail address. Instructions that explain how to join the appropriate list will be e-mailed to you. Technological changes, shifting distribution channels, and new user requirements are reshaping the printer and digital copier industries. Lyra’s Hard Copy Industry Advisory Service provides expert analysis and coverage of digital output devices in the office-printing environment, the consumer market, and the SOHO and small-to-medium-size business markets.